Fred is 6 years old. He is a little charmer! He loves to be held and to hold hands and just be close to others. He is a single orphan who lives with his mother, grandmother, his sister Susan, brother Fred, brother Victor and his Uncle William. All of the siblings, as well as the young uncle, are students at RHO Appleseed School and we are happy to say that they all have sponsors! Neither Fred's mother or grandmother have employment. Fred has been with us since our 1st Saturday in August of 2011. Last June Fred and his brother Isaac had the opportunity to go to a Bible Camp offered by our umbrella organization, Arise Africa. Fred had a wonderful time. It was one of the few times that he had been out of the Bauleni Compound. 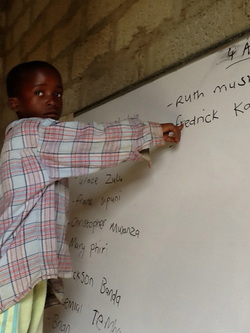 Our new teacher, Agnes, will be keeping track of Fred's academic progress and writing monthly reports. We also hope to have a Family Liaison hired very soon to periodically check in on the families. Fred recently went shopping, thanks to his sponsor! He absolutely LOVED shopping. He wanted everything. He kept picking up more and more. Eventually he decided on pants, shorts, a new shirt and a pair of shoes!